With a third of the width of the average suburban road often occupied by parked vehicles, it did not surprise me that my local authority has acted to reduce the number of parked vehicles on this type of road. Problem is cars have got wider and if two large 4x4s, customised pick-up trucks or large People Carriers converge from opposite directions when the road width is reduced by parked cars then there can be a number of problems. Even more problematical if there is snow or ice on the road and the idiot driving downhill does not give way to the uphill driver! 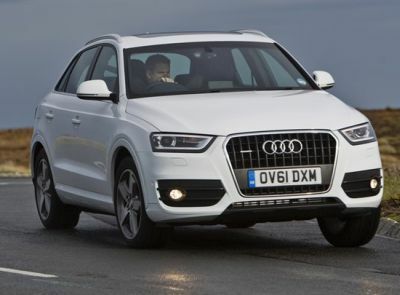 It was under these circumstances that I was glad that I was driving the latest 4x4 or Quattro model from Audi, the compact sized Q3 powered by a mightily efficient 2.0-litre turbo diesel engine. Usually I say that snow is only for skiers or to be pictured on Christmas cards but, by jove, I was delighted to have it visit while using the Q3. Here is a premium class product I (actually made in the ultra-modern SEAT factory outside Barcelona though maintaining the high quality standards that is the Audi hall-mark) that proved to have impressive competence in these conditions yet had the road driving performance qualities of an immensely competent medium sized hatch back. Yes, two idiots barged downhill in that snow forcing me to stop and though irritating it proved that the traction provided by the Quattro all-drive system and the grip from the Continental tyres on the optionally larger 18inch alloy wheels were able to regain traction. It is obvious that the immense flexibility of this powerful 174 bhp diesel engine (there are also a pair of 2.0 petrol units in the model line-up) working through the highly rated 7-speed DSG selectable automatic transmission has the ability to provide the performance potential to cope with some pretty awful driving conditions. That said, apart from a slightly firm ride, the handling qualities under more standard conditions are excellent, the road grip, of course, hard to challenge and the response through the controls, notably the steering, very satisfactory. It feels an easy driving and safe machine (it has a 5-star NCAP safety rating) and has plenty to offer the discerning driver with one eye on the budget. Top speed is in the 132+ mph region with 60 mph reached from rest in a shade under 8.5 seconds which are good figures for a car of this size/weight and with an official combined fuel consumption of 42.9 mpg is reduced to a real world figure nearer to 35mpg. I think Audi’s designers have worked closely with the marketing men to ensure that the Q3, though smaller, has an imposing appearance rather like its larger Q5 and Q7 siblings, thus ensuring a good degree of the wow factor that some buyers find essential with this type of vehicle. As one who is conditioned to judging a car more for what it can do rather than what it looks like I suggest that the Q3 is the right balance of sensible size and status just about right. As I expected when first driving the Q3 I found that the driving position has all the right adjustment facilities to ‘tailor’ a high degree of driver comfort suitable for hours of relaxed and tireless driving. Driver’s forward vision is better than average, rearwards is challenged by the high rear window though parking sensors and visual parking graphics combined with the satellite navigation on the test car complemented the large exterior mirror. Above all, the compact dimensions make for easy parking access. Add to that a feelgood factor provided by the business-like yet exquisitely finished fascia and instrument cluster that has clearly been designed to cope with a number of cost-extra options requiring fascia space without compromising the overall appearance. Higher ground clearance make for a slightly loftier height although the interior height is average rather than generous and with seating space for five occupants the rear accommodation is passable both for head and leg space providing the occupants are none too tall. Luggage capacity at around 450+ litres with all seats in use is about that of an average boot on a medium sized car but with the 60/40 split folding rear seats and the ski hatch the practicality is obvious. A metal threshold to the luggage area, incorporating a protective system to prevent the tail-gate catch snagging items when loading is a very sensible innovation, and the practical and logical oddments stowage facility around the car’s interior also indicated thoughtful planning. All Audis are bespoke ordered rather than off the showroom shelf and on this test car were many of the items that buyers add for their own preferences and according to their budget. Thus this added to a pretty comprehensive basic package items like voice operated satellite navigation, panoramic glass roof panel, leather upholstery, BOSE sound system, larger alloy wheels (but no spare) and glacier white paint and more. Price from: £28,460 on the road – as tested: £40,040.